We may be in Thailand, often advertized as the world’s kitchen, but the best Italian food should have some Italian heritage, as after all, pizza is practically the national dish of Italy. Italian pizza has been around a while. One thousand years ago the term had appeared in Medieval Latin. In the 17th century, the pizza as we know it today was made with oil, cheese and, tomatoes. In June 1889, to honor the Queen consort of Italy, Margherita of Savoy, the Neapolitan chef Raffaele Esposito created the “Pizza Margherita,” a pizza garnished with tomatoes, mozzarella cheese, and basil, to represent the colors of the Italian flag, still available at all good pizza kitchens today. Pizza Pizza by Yanee, Italian Bistro and Wine Bar is on the ground floor of the Avenue on Second Road. Airy and glassed in, you will not miss it. This Italian restaurant has its Italian roots, too. Chef Sam Armenio is an Italian Australian who can trace his ancestry back to Italy, not quite to Raffaele Esposito, but close enough. 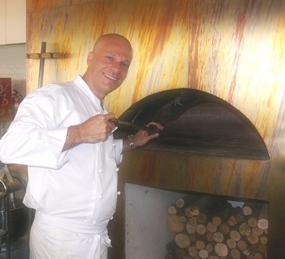 Not only that, he studied the art of making pizzas in Napoli at the Brandi Pizzeria, the oldest pizzeria in the world. 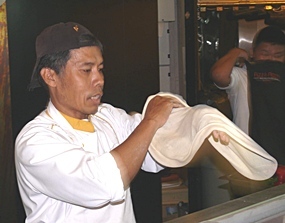 However, Sam, like many Italian chefs, is passionate about his creations, and not just pizzas. However, he spoke of his 100 year old ‘mother yeast’ with reverence. And this is the time to introduce the fact that Pizza Pizza by Yanee has changed and is much more than a pizza restaurant. It is now an Italian Bistro and Wine Bar that offers house wine at B. 49 per glass. It works out even cheaper if you buy a one liter carafe. A choice of Chardonnay or Sauvignon Blanc in the whites or Cabernet Sauvignon or Merlot in the reds. We tried all four, and remembering that wine appreciation is a personal thing, we very much enjoyed the Sauvignon Blanc and the Merlot. But try for yourself. There are many bottles of wine as well with the top of the range only B. 1899. At B. 49 a glass for the choices of house wines, you are losing little if you are interested in trying them all. We went as a group and carried out a tasting of many items in the menu, right from the humble Pizza Margherita (not very humble, but delicious and at B. 240 for the large pizza not expensive), a smoked salmon with mascarpone cheese and then the ‘Sam Special’ (B. 490 for a 12 inch) which has ham, Napoli salami, Australian button mushrooms, shrimp and roasted vegetables and a little spice. Sensational, was the only word to describe it. From there we were into numerous pastas including an Alle Vongole clams tossed in white wine with extra virgin olive oil and Italian parsley (B. 220), deep-fried calamari (B. 180), cheesy garlic bread (B. 130), home-made Italian sausage, fettuccini tossed in a pink cream sauce with smoked Norwegian salmon and crown dill (B. 280). Sam explained that the fettuccini is specially made in Chiang Mai using Italian flour which absorbs the sauce, making the flavor go right through the pasta. He was correct. This was another magnificent dish. One that I particularly enjoyed was the ravioli foie gras in a truffle cream sauce (B. 320) which was just so smooth and flavorsome (and probably thousands of calories). The lasting impression from the visit to Pizza Pizza by Yanee, Italian Bistro and Wine Bar, was great food and great atmosphere being generated by Chef Sam, Maitre d’ Scott and all the staff. 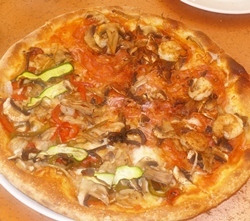 It is far more than a pizzeria, with a very extensive bistro menu, and very reasonable prices. Would we go again? Very much so, and in fact we ordered (and paid for) a pizza to take home. By the way, home deliveries can also be done, free in the inner city and a small premium if outlying suburbs. 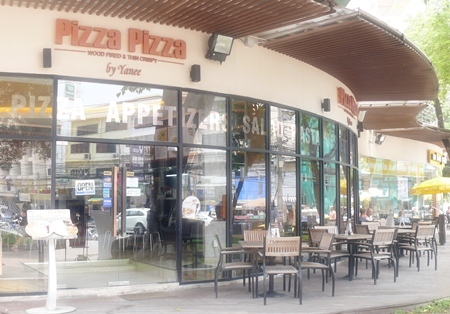 Pizza Pizza by Yanee, Italian Bistro and Wine Bar, The Avenue ground floor, Second Road, Pattaya City, telephone 038 723 928, open seven days 12 noon until 10 p.m., parking in The Avenue parking station (remember to get your ticket stamped before leaving the restaurant).